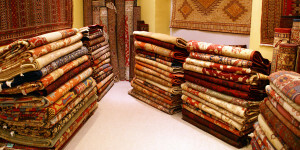 Ottawa’s leading Area Rug Cleaning Service uses only green cleaning methods to clean your precious natural fiber rugs. ECO-PRO Ottawa Rug and Carpet Cleaning provides the safe and eco-friendly area rug cleaning solution for your home or commercial establishment. Our 5 step natural, eco-friendly cleaning process uses full submersion cleaning to neutralize odour, remove stains, and virtually eliminate pet dander, dirt and dust from your wool area rug. Your family, your pets and the environment are important to you so we use safe green cleaning for your Ottawa area rugs. Eliminating stubborn stains that your cat or dog may have left behind on your delicate area rug can be difficult. ECO-PRO Area Rug Cleaning in Ottawa has come up with a pet friendly, ecofriendly, safe and healthy way of eliminating pet stains in your area rug. Have confidence knowing that your Persian rug, Indian rug or delicate silk or wool area rug was cleaned using a non-toxic cleaning method leaving you with a safer environment in your home. Moth treatment and repair is also available. ECO-PRO Area Rug Cleaning in Ottawa provides professional, knowledgeable staff, knowing what methods to use to green clean your area rug. When cleaning area rugs, it’s crucial to pair the right treatment process with the right delicate rug. No matter what treatment we use for your area rug cleaning, we guarantee it will be 100% green, eco-friendly, safe and healthy for you, your children and your pets. Persian rugs, oriental rugs, cotton rugs, silk rugs, wool rugs and many more types of area rugs can be easily damaged if they are not cleaned properly. Ottawa trusts ECO-PRO Carpet and Area Rug Cleaning with their delicate natural fiber rugs because of ECO-PRO knowledgeable staff and safe, eco-friendly, green cleaning methods. Keep your Persian rugs, oriental rugs, cotton or silk rugs, looking their best by cleaning them regularly.